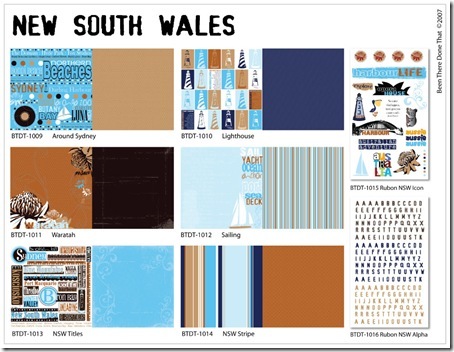 there's a decidedly nautical feel to the new south wales range of papers, complete with images of light houses and sail boats, and there is obviously an influence of the beauty of the sydney harbour in there. 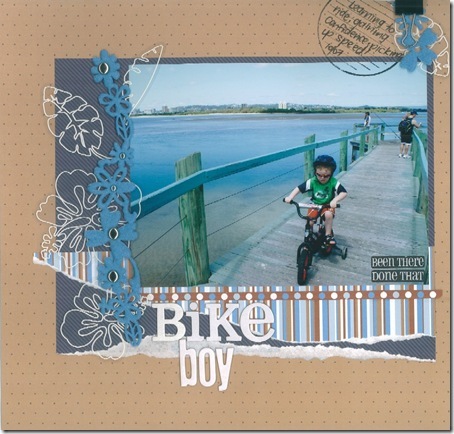 But even if you've never been to sydney, these papers happily work for any beachy coastal pages, and better still - the blues and browns are perfect for any boy pages. we thank guest designers Kim Wiseman, Lee Longmire, Melina McGreevy, Allie Collyer, Carole Janson, Jo Sinnamon and Lisa Warren for inspiration today, along with Aussie Scrap Sources' own Caz McLachlan and Di Turner. 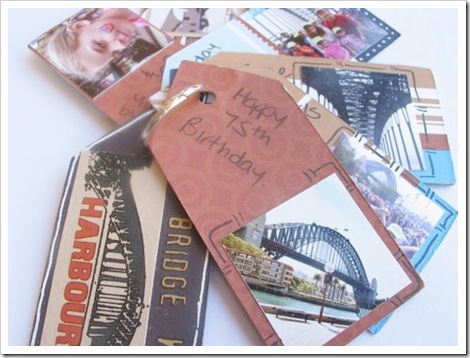 Caz wanted to keep her page simple to highlight these lovely photos she took of one of her favourite places in the world, Sydney Harbour. She has spliced the main photo twice to make it a little more interesting. Caz loves how the different 'States' match in so well together. Here she has mixed NSW and ACT papers. 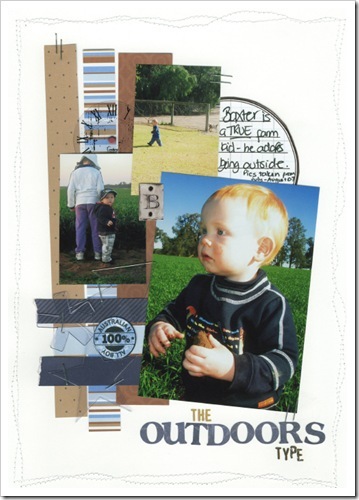 The huge variety of things on the title pages make putting together your own page accents quick and easy. 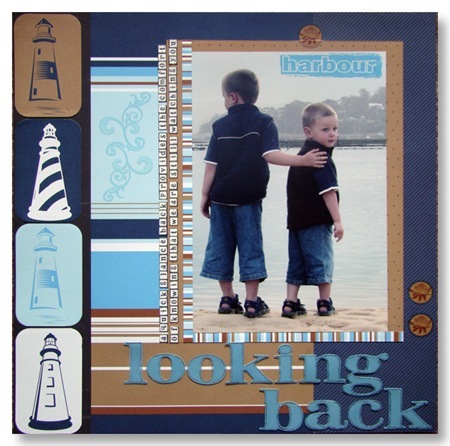 Cheryl found these papers worked beautifully with this wonderful photo of her two sons at the beach. 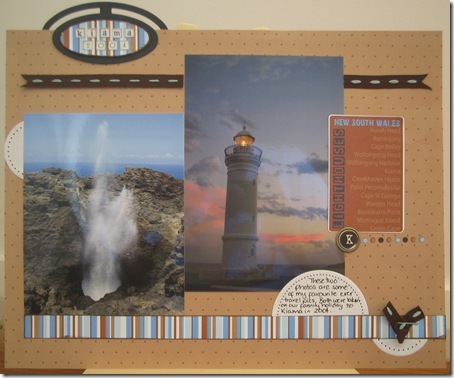 She has cut out and use the lighthouses as a simple but effective embellishment. Kim Wiseman has also used the stripes on her great double layout, as well as turning the placenames into a pocket to keep mementoes of her trip safe. 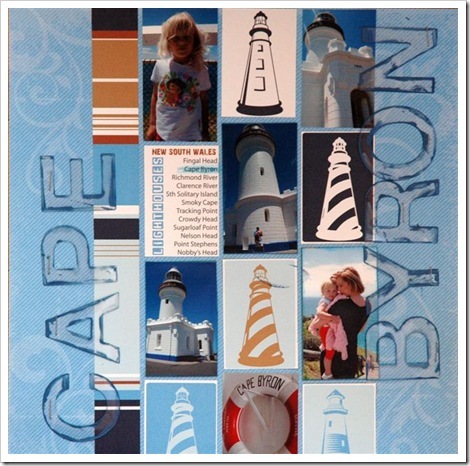 Di Turner has created this fabulous single layout using images from the Lighthouse paper, highlighting the real light house at Cape Byron as well as other holiday snaps. She has dabbed paint around Heidi Swapp Ghost Letters giving this page an airy, summery feel. One thing we hear all the time is that Been There Done That papers are perfect for scrapping the older holiday snaps that have been sitting in the 'too hard' basket for too long. Melina McGreevy pulled out her Sydney snaps from 2002 to scrap, starting with this page. The more solid patterns keep the photos firmly in the focus, while the colours work with them perfectly. 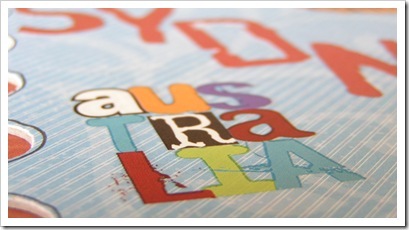 Melina has added a touch of colour interest with the Australia rubon. 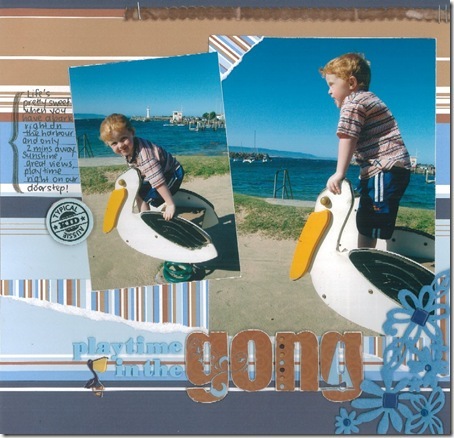 Lee Longmire: I had these photos (two of my favourite ever travel snaps especially as they are from my old film camera) from a trip to Kiama in 2003 that I have been wanting to scrap for ages, so these papers were absolutely PERFECT! 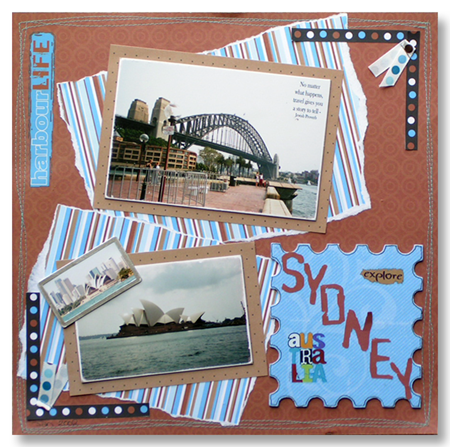 From the BTDT range, I used the NSW papers "Around Sydney" (reverse brown with dot), "Sailing" (reverse stripes) and "Lighthouse" (cut-out panel), and some of the NSW rubons (the little dot set next to the K). The BTDT papers are a really fabulous weight to use, they take sanding and inking really well too. They are sturdy enough to use as a background panel which is great, and the colours are gorgeous. Other items used were the Adorn It by Carolees Creations tiny retro alpha stickers and numbers, Heidi Swapp circles journaling spots, Basic Grey oval book clip, Lil Davis metal memorabilia Circle Frames (with a Deluxe Designs Tag Alongs alphabet K on it), and some SEI Grannys Kitchen stitched ribbon. 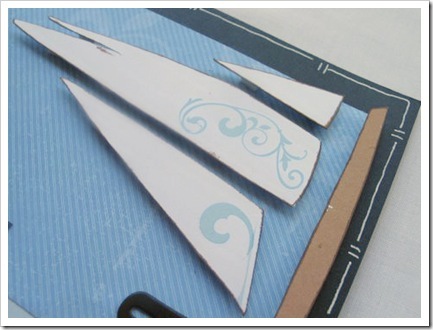 I used the Heidi Swapp edge distressing tool on the edges of the Sailing paper that was stuck to the book clip chipboard, and used some Heidi Swapp sandpaper to lightly sand it back. Then I inked the edges of this oval as well as the edges of the striped strip on the main part of the page. Lee Longmire: These are pics of my little boy Baxter taken on various days in July & August this year. 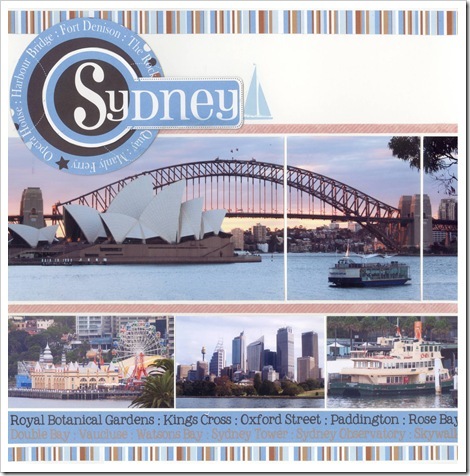 I have used offcuts of the Around Sydney (reverse dots), Sailing (reverse stripes), NSW Stripe (reverse circles), as well as the NSW Alpha rubons (for The & Type) and the 100% Australian All Boy rubon ( that was added to a circle of the reverse NSW Titles paper). Other products used were the Heidi Swapp edge distresser and Heidi Swapp sandpaper to rough up the small circle of paper before putting the rubon on it. Heidi Swapp Ghost Shapes (clock, star, arrow & asterix), Hambly Jounaling 2 circle rubon in brown was used on some Scenic Route graph paper, Basic Grey alpha stickers (for Outdoors), Deluxe Designs tag alongs monogram alpha B, Heidi Grace brad (on the clock). 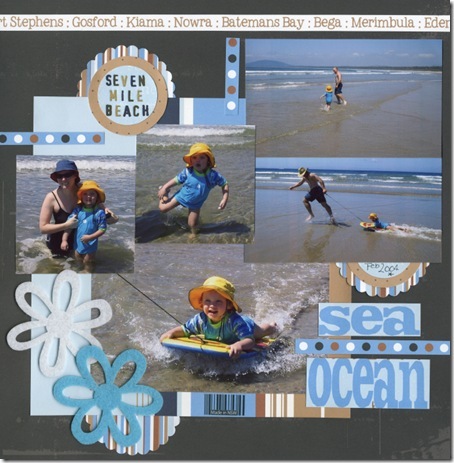 Lee Longmire: I have scrapped some holiday snaps from Seven Mile Beach at Gerroa in 2004. I used the BTDT NSW papers. Waratah (reverse) as the base, NSW Stripe (8x8 square), Titles (word strip), Sailing (words ocean & sea, front pale blue circle with rubons/journaling on it and reverse small stripe) and Around Sydney (front dotty strips, and reverse small dot). Other items used were the BTDT NSW Alpha rubons, BTDT "made in NSW" barcode rubon, and Queen & Co Flower Frenzy self adhesive felt flowers (pastel). 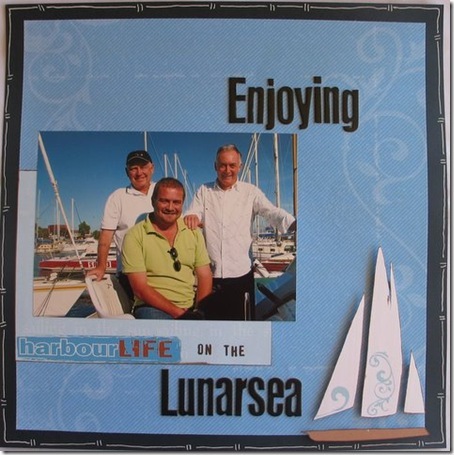 Lisa Warren: The NSW range of Been There, Done That papers and rubons were ideal for this layout. They are masculine, reminiscent of the sand, sky and sea and coordinate perfectly. I covered chipboard letters by Scenic Route Co. in the reverse side of the papers and applied rubons and dimensional magic to them. The rubons were incredibly easy to use. I've also used felt by Queen and Co and Heidi Swapp plastic letters - the colours of both blended well with Been There, Done That. 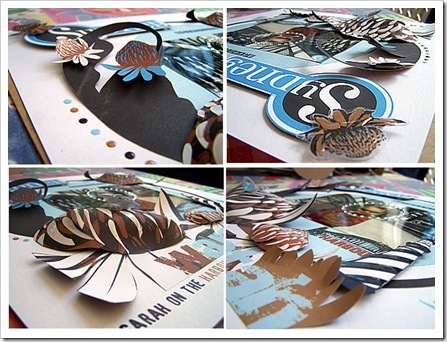 Lisa Warren: The reverse sides of the paper are absolutely gorgeous! 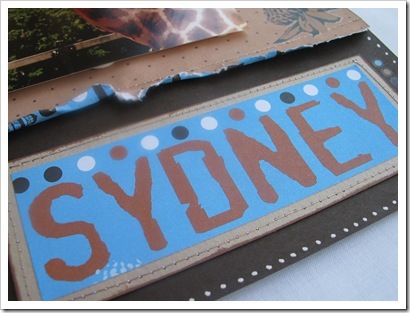 I was able to use the papers for something other than a "NSW" inspired layout. 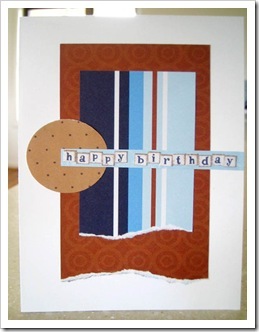 I've also used a strip of dotted paper from the words sheet to add a little contrast to the stripes. 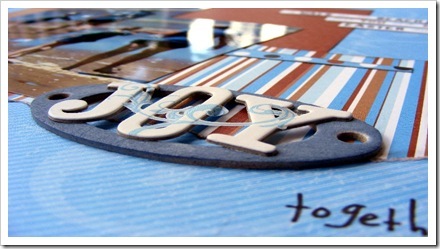 Once again, Queen & Co felt, Heidi Swapp chipboard letters and acrylic shapes matched perfectly. Jo Sinnamon: This year we have been trying to get out of the comfort zone of just staying at home, so we've made an effort to get out and about from Rocky. 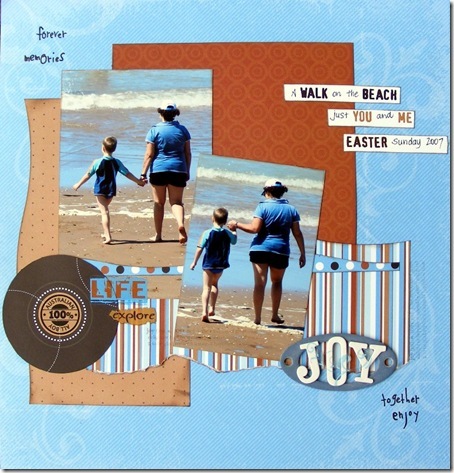 The blues and browns of these papers were a perfect look for some photos my friend Ali took of my youngest son and myself just walking the waters edge - it's not often that Harry slows down long enough to do something like this - walk hand and hand with his mum." Allie Collyer: As soon as I saw these papers I knew which photo I was going to use for the Sailing paper. The blue was perfect for the pic and I cut the sailboat out of the PP, mounted it on thin chipboard and then used foam dots to add dimension. 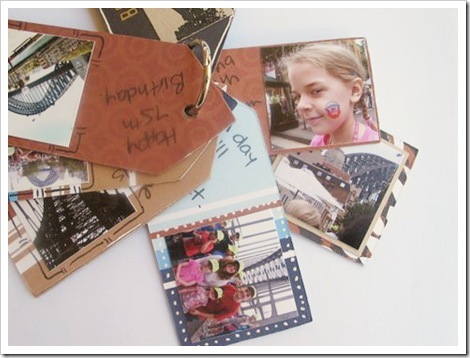 Allie Collyer: These papers were fantastic for one of my fave photos. 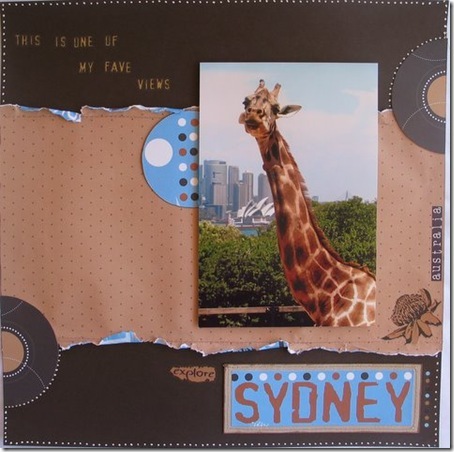 I didn't want to do too much on the layout so the gorgeous giraffe would take centre stage. I I cut one of the circles into 1/2 and then separated them for a simple embellishment. 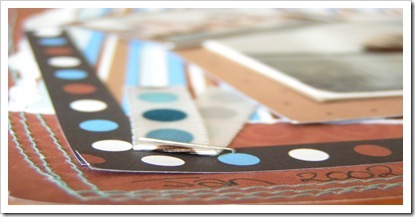 The double sided papers were perfect for stitching and rolling so that the edges showed the lovely blue on the back. 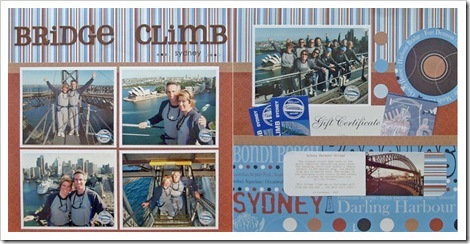 Allie Collyer: Harbour Bridge Mini Album - a friend had taken her family to do the walk for the bridge's 75th birthday. I used the offcuts of paper to make a simple mini tag ring. 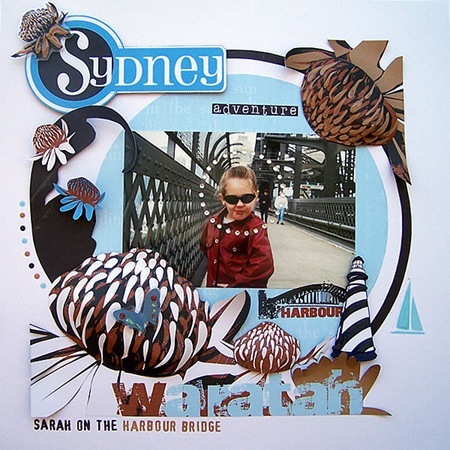 Carole Janson: The inspiration for this layout came from the photo, my daughter had a great time walking over t he bridge, and she had even more fun getting her photo taken on the bridge. I made the Waratah Flowers in to bowl like flowers and made sure the pattern was on the outside of the bowl. I also used Dimensional magic to help parts of the waratah flowers stand out. I had a lot of fun with the rubons on this layout, and I also used dimensional magic on the rubons to give them dimension. 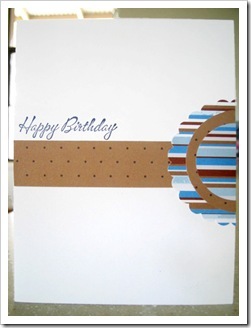 Chris Millar our card queen strikes yet again wth these two simple but perfectly formed cards. And today the lovely Lee Longmire keeps her company with another couple.